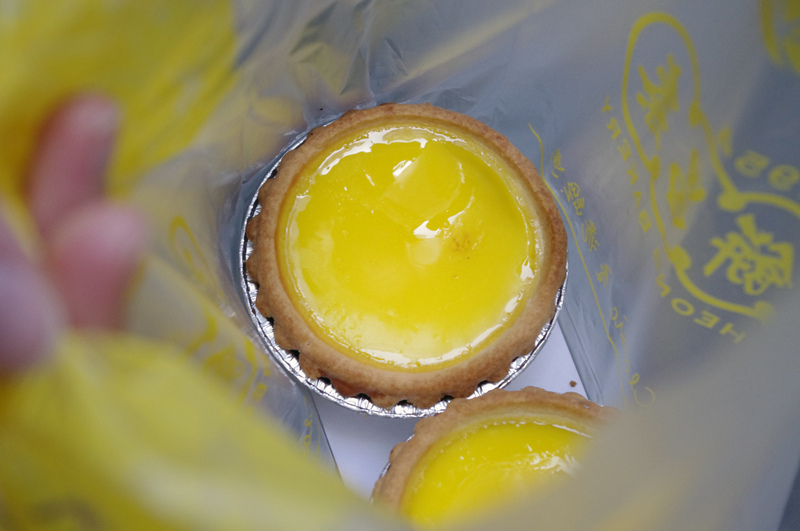 For a taste of Hong Kong's favorite dessert head to Central to the Tai Cheong Bakery and get yourself a Hong Kong style egg tart. Tai Cheong bakery has been around since 1954, and has always been a local favorite. In the 90's Tai Cheong's fame got a little boost becoming a tourist hotspot when the British governor, Chris Pattern, declared they had "the best egg tart in the world." Since then the line ups have been pretty consistent with a blend of locals and tourist stocking up on this golden treat. Does Tai Cheong have the best egg tart in the world? Well to answer that you need to understand that these are not Portuguese egg tarts—meaning they don't have a flaky crust and they aren't caramelized on top like a creme brulee. These tarts have a soft buttery cookie-crust, and are baked just enough that the egg filling turns to a silky smooth jelly like texture, and never browned on top. So you need to understand going in that these are Hong Kong style egg tarts and so are different than what you might be use to. Are they the best Hong Kong style egg tart in the world? Probably. The tarts are served warm, sometimes piping hot actually, so even though you're excited to bite into your little dessert be careful to let it cool properly so you don't burn your mouth. The line up at Tai Cheong to get these tiny egg filled desserts is usually long, and filled with camera touting tourists and locals of all ages. Although there are several locations all over Hong Kong (probably one close to your hotel), most people still prefer to go to the original location on Lyndhurst Terrace, which might be because it's so busy. Busy means the bakery churn out a lot of tarts, and you're sure to get a freshly baked one opposed to one that's been sitting in the case for a few hours. The original shop is also located in a nice little neighborhood in Central with a few other cute shops and pastry places to visit, so it's worth the bit of extra wait you'll face in the line. The recipe is the same at all the locations though, so if you can't make it to the original shop it's not the end of the world. Tai Cheong also does a sugar coated doughnut that's quite good, they are also served warm and make a nice complement to the egg tart. The hours vary from location to location but most are open by 8am and stay open until after dinner. Also make sure you bring cash, most of the Tai Cheong locations only take cash.